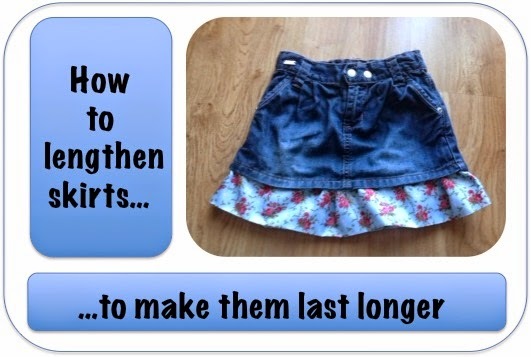 This time, instead of pants and shorts I decided to show you what I do to skirts that are still wearable but that have become too short for my little girl. Cut a strip of fabric a little over half of the length you want to add to the skirt. If you want the fabric to fall strait, cut it exactly the same width as the lower edge of your skirt (plus seam allowance). If you're going for a ruffled effect, add additional width. The folded edge will be the skirt's new hem, the top (where both edges join) will be hidden underneath the original skirt hem. Then, with needle and thread, add some stitches to the top of the strip of fabric, pulling slightly as you go, to create the ruffles. Adjust the ruffles and pin the fabric to the skirt. Make sure the side seam of the fabric matches one of the side seams of the original skirt for a cleaner, more professional look. Sew the fabric in place. I used a dark blue thread and sewed over the original hem, so the new stitches are virtually invisible. On skirts of other colours you may need to improvise. Thank you for stopping by. Loved your blog, added to my favorites list! Thank you Jess, have a wonderful week! Kids do indeed grow out of their clothes so very fast. This is great creativity to stretch the budget. Thanks for sharing with us at Merry Monday. I am looking forward to your shares with us next Monday! Great idea. I will use it for my granddaughters!!! Than ks for sharing. Thank you for the invitation, I love linky parties. Off to check your blog! This is such a great idea! My nieces grow out of their clothes so fast. 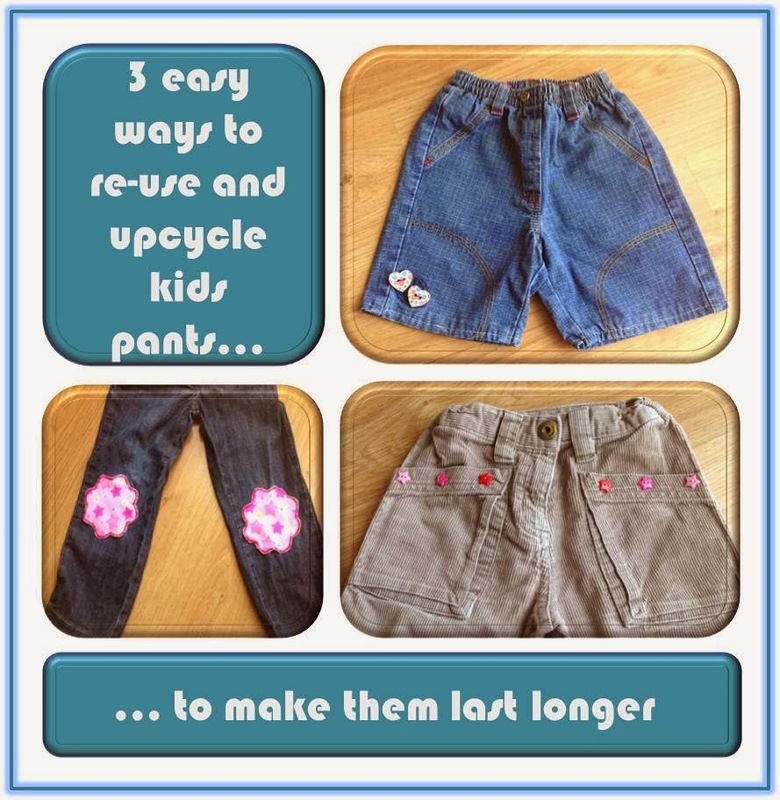 All kids do, so I'm always trying to find ways to make clothes last a little longer...Thank you for stopping by! Another great trick to use! Thanks for linking up at My 2 Favorite Things on Thursdays! Come back again next week!! This is such a cute idea! If I have a little girl one day, this will certainly be something I will need to keep handy! A great way to extend the life of a little girl's skirt, Teresa!!! Ruffles and denim look fabulous together. Than you Pam! Have a wonderful week! What a great idea! Thanks so much for linking up at the Totally Terrific Tuesday Link Party last week. Please come back again this week...we'd love to know what you've been up to. The party starts at 10pm. I hope to see you there! Kiimberly, your party rocks and I love to link up! Actually, my two latest projects are already there! I love this idea! I have a daughter whose waist never seems to grow bigger, but her legs get longer all the time. I hate having to buy her bigger skirts because then I have to safety pin the waist. This will be a great way to solve that problem. That sounds just like my daughter, that's why I had to come up with this solution...Thank you for stopping by! I think this is cuter than the original skirt!! I made something similar, using overalls to make a kid's apron. Love how you showed each step! I saw your overalls to apron post, it looked great! Thank you for stopping by, have a wonderful week! I swear they sell skirts for kids way to short now days, it's crazy! great way to fix the length and dress it up a bit at the same time :) Thanks for sharing the idea with us at the creative challenge! I've noticed that too. I have several more skirts that need the same treatment as this one, too! Thank you for visiting, have a great week!